Mozovitch are a young (average age of 17!) 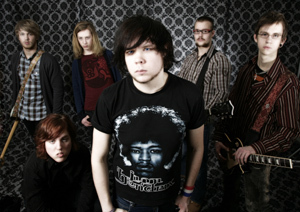 new Swedish band that plays real 70’s style hard rock with a bluesy edge. The band played at the Sweden Rock festival outside the main festival area but I did not get a chance to see them, sadly.. The CD opens with a foot stomping track and the singer will immediately remind you of Phi Lynott. The band has a good sense of melody and writes good solid but not great memorable tracks. The real difference between the bands of the 70s and this one is mainly that these guys are totally holding back. When there is a keyboard or a guitar solo, they are all like 15 seconds long and right back to the “safe” chorus… A lot too much singing and far too less playing…but hey ..these kids are young and it is just great that they want to play this kind of music and not pop crap.. Give them some years to mature and if they open up and start to jam and improvise and play (if they can), they will be a great band.. This I am certain..